For his 41st and final feature film, Joseph H. Lewis was able to combine the two genres in which he had excelled. The man in the director s chair for My Name is Julia Ross, Gun Crazy and The Big Combo, Lewis was one of the all-time greats in film noir. But he was also a fine director of Westerns, having made A Lawless Street, 7th Cavalry and The Halliday Brand, all of which especially the last remain underrated. 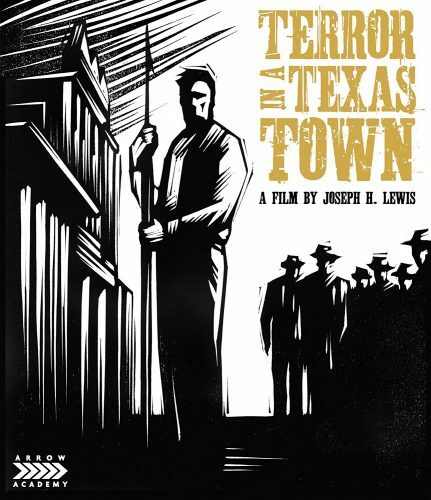 Terror in a Texas Town would bring his noir sensibilities to the American West, resulting in one of his finest works. Terror in a Texas Town was written by Dalton Trumbo, one of the Hollywood Ten blacklisted by the film industry and forced to write under pseudonyms or to use fronts . Two years before he helped break the blacklist with on-screen credits for Otto Preminger s Exodus and Stanley Kubrick s Spartacus, his work was credited to Ben Perry, but it demonstrates a psychological depth and political dimension that is undoubtedly that of Trumbo. Terror in a Texas Town is not your standard Western filled with Gun Slinging. Its Bully Vs Swedish Whaler, Who Wins? George Hanson returns home after a long time at sea only to find out his father was killed and the rest of the town is being chased off and or killed for land they live on. A Greedy Banker hires a one Handed evil Gunslinger Assassin to help get this land which may or may not have oil on it. The Final Show Down pits A Gun VS Harpoon and a small town that may be doomed. The plot was fun but has been done before granted it does bring in a few different elements to the table like a Whaler whom stands up for the town at the end of the film. He’ not a gunslinger but does have a Harpoon to face the bad guy during the showdown. Action wise were looking at a killer killing a few guys but we don’t get any big shoot outs. The Bad Guy does get under your skin some so you do hater the guy which is a plus. Acting wise its decent, the lead is rolling with a Swedish accent I think which may or may not bug you. I Found it OK. Overall the film was a good watch, not a classic western but does bring a few different things. Its pretty short at 80 minutes and it’s not a hard watch. If your into westerns, I say give it a shot. But just know it’s not a big action film and some may find the acting off at times. With that said I give this film a 3.5 stars out of 5 as I did enjoy the film.